A rare and prestigious wine, l’Hermitage (the very one that used to be served at the court of the Tsar), was once sold at Lafite and Romanée prices. 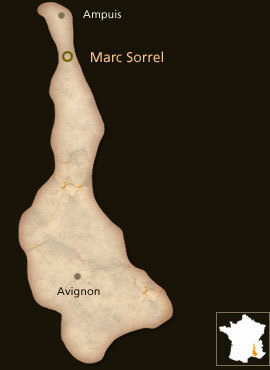 Marc Sorrel, a vigneron since 1984, wisely cultivates his old vines in the noblest farmhouses of the vineyard. Le Méal, whose soil consists of large pebbles, produces the smoothest and most aromatic wine of the appellation. 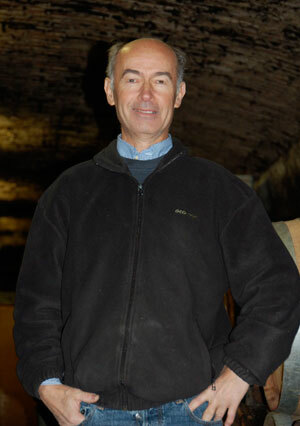 Very near to Méal is les Rocoules, where the white wine is powerful, distinguished and of an undeniable elegance. The vineyard has been in operation since 1928, when Marc’s grandfather established the estate. The estate is situated in the northern Côtes-du-Rhône, on the left bank of the Rhône. The vineyard benefits from a Mediterranean microclimate due to its full southern exposure, which shields it from the cold winds of the north. The precise origin of vine-culture at the Hermitage is unclear, but it is quite likely that the first vines date back to Roman times. 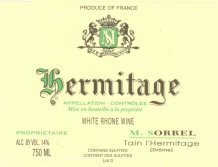 Interestingly, several texts attest to the fact that in 1787, Thomas Jefferson, while traveling in France, wrote of l’Hermitage blanc as the best wine in the world. 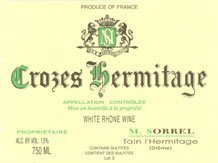 This declaration is substantiated by the fact that in the 19th century, l’Hermitage blanc was the most expensive wine in the world. As for l’Hermitage rouge, it was so highly esteemed for its color, tannins and alcohol that in the 19th century, it was blended with the best Bordeaux wines (Margaux or Lafite) for the English market. Marsanne 50% and Roussane 50%, 50-year-old vines found on the Terres Blanches de Larnage. Barrel maturation. Elegant and aromatic, notes of vanilla and acacia honey. It will develop nicely over four to six years. Pairing: Fresh water fish, pie dishes, or even as an aperitif. Syrah, from a fairly recent plantation on slopes of the Larnage commune. A gentle wine of dark red color with bramble and spice aromas. Maturation in oak barrels. Pairing: All red meats, tournedos, liver, veal kidney, toutes les viandes rouges, tournedos, foie, rognons de veau. 100% Marsanne from 15 year old vines in the farmhouse of Greffieux , which is located under the Méal , and whose wines are renowned for their delicacy. Cuvée Prestige Rich and viscous, at once dry and unctuous, possessing of a truly pure flavor. A dazzling finish of vineyard peach, vanilla and honey. Cuvée Classique Syrah, 30-year-old vines in the Mas des Plantiers, located beneath les Greffieux. Cuvée Prestige A delicate bouquet of violet, black currant, and blackberries. Heavy, yet harmonious tannins and an impressively lingering flavor.